A government witness at the trial of drug lord Joaquin "El Chapo" Guzman Loera testified Tuesday that he paid a multi-million dollar bribe to a former underling of Mexico's president-elect. On his third day on the witness stand in the sensational trial in federal court in Brooklyn, Jesus Zambada described giving payoffs to two officials in the Mexican government in the mid-2000s. One was Gabriel Regino, who at the time was working for then-Mexico City mayor — and current Mexico President-elect — Andres Manuel Lopez Obrador. Zambada said he paid Regino "a few million" on behalf of his brother, who prosecutors say runs the Sinaloa Cartel with Guzman. Regino, who now works as a criminal law professor in Mexico, took to Twitter to deny the allegations, calling them "false" in Spanish. Zambada also recounted handing over a suitcase with $3 million inside to Genero Garcia Luna in 2005 or 2006, when he was director of Mexico's Federal Investigation Agency. He said he gave him millions more a year or two later, when he was named secretary of public security. Efforts to reach Garcia Luna by Reuters were not successful. Zambada made the claims while being cross-examined by Guzman's lawyer William Purpura. Attorneys for Guzman maintain he's been "framed" as a drug lord, and the real leader of the Sinaloa Cartel and its multi-billion dollar drug business is Zambada's brother, Ismael "El Mayo" Zambada. "El Mayo" is still on the loose, likely somewhere in the mountains, his brother testified. 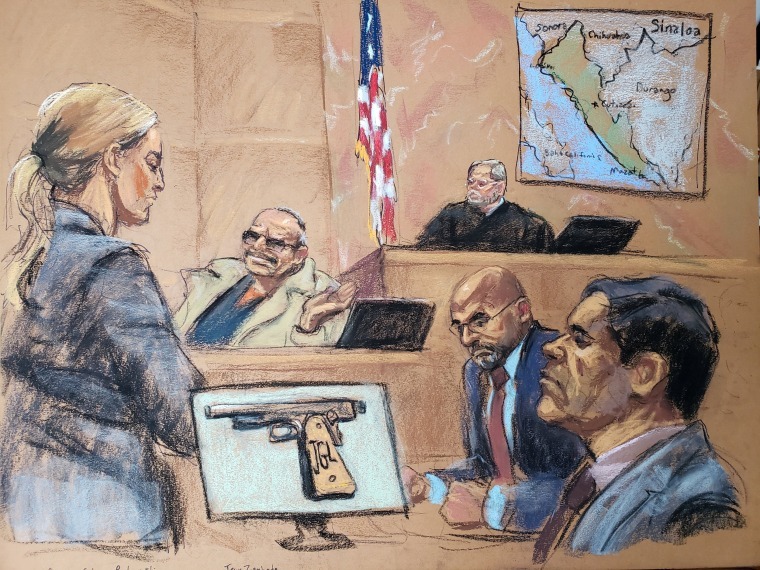 Zambada has testified that "El Chapo" and his brother were partners, and has portrayed Guzman as a bloodthirsty hothead whose favorite weapon was a diamond-encrusted pistol. On Monday, he recounted his brother telling him that Guzman ordered a competitor killed after the rival had refused to shake his hand in a 2004 meeting. In Mexico, he had already been sentenced to 20 years behind bars on drug trafficking charges in 1993, but then escaped the Puente Grande Federal Prison in Guadalajara in 2001. He was recaptured in February, 2014, escaped again in July, 2015, and was caught again in January, 2016.